Apart from a brief appearance in Inferno, I am really surprised that Dan Brown hasn’t written a book set in Venice. Dotted around the city are hundreds of carved symbols, most of which look like they would make a perfect treasure hunt for Robert Langdon, who is after all a ‘symbologist’, to follow. Most of them go unnoticed by tourists and visitors but if you understand them they offer a fascinating insight into daily life in the Venetian Republic and what the city would have been like prior to the 18th Century. Luckily, in the absence of Robert Langdon, you have me to explain them for you. Although symbols like these are found all over the city, I’ve chosen to focus on the Rialto area since there is a large concentration of them there making them easy for you to visit. 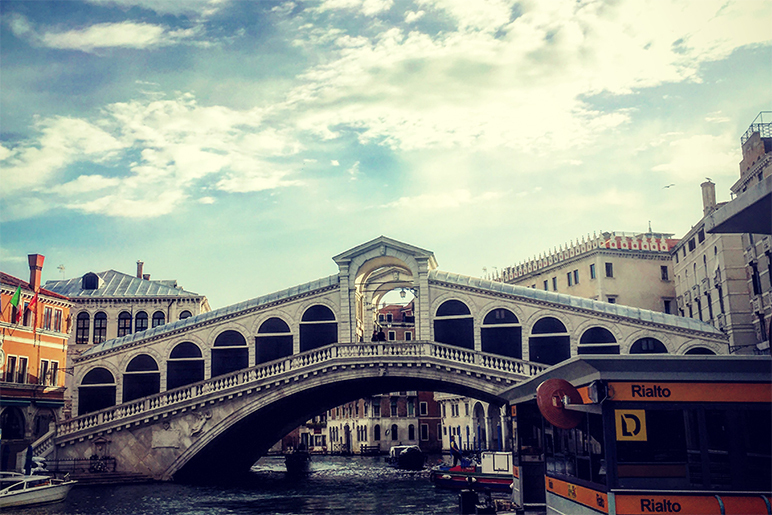 They are all to the north and west of the Rialto Bridge in the sestiere of San Polo. For convenience, I’ve divided the ones I’m going to show you into four main categories: guild symbols, scuola grande symbols, coats of arms, and religious symbols. Once you understand these, the ones in other parts of the city will start to make sense too. The guilds of Venice started in medieval times as artisans got together to help protect and promote their industry. As with almost everything in Venice, the state soon got involved and a system was created in which the guilds were set up officially, with statutes (mariegole) approved by the government and lodged in the state archives (where they remain to this day). In the 16th century guild membership became compulsory for all artisans and shopkeepers and the guilds were given the responsibility to provide soldiers and sailors from among their membership in time of war. Each guild, or arte had a headquarters, often in a church, but the larger and more important guilds had their own building known as a scuola. These buildings were used for meetings and ceremonies and were often decorated by famous artists. The guilds charged their members fees but membership of a guild also acted as a form of social security. Needy members received medical assistance and sometimes housing from the guild and often the guild paid for their funerals. By the end of the Republic, in 1797, there were about a hundred guilds comprising everything from shoemaking (l’arte dei calegheri e zavatteri) through sausage making (l’arte dei dei luganegheri) to carpentry (l’arte dei marangoni). My favourite, however, has to be l’arte dei lasagneri, which is exactly what it looks like: the guild of lasagna chefs, set up in 1639. Each guild had a symbol which was often carved onto buildings to show that the owner or shopkeeper was a member. There are three wonderful examples in Campo Rialto Novo. The first is a barrel, the symbol of l’arte dei botteri, the guild of barrel makers. As all liquid was kept and transported in barrels or bottles this was one of the largest and most prestigious guilds in Venice. This guild ended up being rich enough to commission a painting by Tintoretto to hang in their local church. The painting, which is now in the Gallerie dell’Accademia shows the presentation of Jesus in the temple with the barrel symbol in full view on the steps before the altar. The second sculpture in Campo Rialto Novo represents a pine cone. I’m not sure which guild it represents but will do some more research and update this page if and when I find it. The third sculpture is of a mulberry tree, the symbol of l’arte della seta, the silkmakers guild. Mulberries are used to feed the worms that produce silk and the tree makes a nicer symbol than a worm. A mulberry bush, symbol of the Guild of Silkmakers (Arte della Seta), Campo Rialto Novo. In Ruga dei Spezieri (the street of the spice merchants) a few metres from Campo Rialto Novo, we find this wonderful double sculpture of what appear to be peaches. This was the symbol of the guild of fruitsellers denoting that the building was a fruit shop. In addition to the scuole of the guilds, there were in Venice six scuole grandi, religious confraternities dedicated to helping the poor and needy. Unlike the other scuole, whose members were artisans, the members of the scuole grandi came from the cittadini. This was a closed middle class whose members were mostly merchants and civil servants. Many artists also came from this class. (Records at the Archivio di Stato in Venice show that my family was part of this class.) Each of the scuole grandi had a lavish headquarters which can still be seen today. Each scuola grande had its own symbol and these were carved onto the outside of buildings for various reasons. If you see one of the symbols outside a grand house, it meant that the owner of the house was a member of the confraternity. If it was outside a lower status dwelling, then the building belonged to the scuola grande and was a form of social housing. You also see them outside shops which showed that the scuola grande owned the building and collected rents. In Ramo dei Do Mori you can see a kind of celtic cross carved into a pillar oustide a shop. This was the symbol of the Scuola Grande di Santa Maria della Carità. The headquarters for this confraternity now houses the Gallerie dell’Accademia. Nearby in Ruga dei Oresi you find the symbol of the Scuola Grande di San Rocco. This is one of the two confraternities which is still in existence and its headquarters, known for their rich decoration by Tintoretto, are a museum. I mentioned the cittadini earlier. There was another closed class known as the patricians or nobles who were the ruling class of Venice. The males of this class had the right to sit in the Great Council, sort of the parliament of Venice, from which were elected all the city’s magistrates including the doge himself. Each family had a coat of arms which you see splashed across the front of all the palazzi on the Grand Canal. However, you sometimes see the coats of arms on low status buildings and shops. This showed that the family owned and acted as landlords for the building. In Campiello del Gambaro there is an example. It’s the coat of arms of either the Zorzi or Polani family. We can’t tell which because they had a similar coat of arms but in different colours. Unfortunately the paint has rubbed, or been cleaned off over the centuries. Both of these families had doges: Pietro Polani (1130–1148) and the shortlived Marin Zorzi (1311–1312). A fourth category consists of religious symbols. These would have been carved to show that the owner was particularly devoted to, or considered themselves to be under the protection of, a particular saint. In Calle del Gambaro there are several examples of a carving of Saint Adrian on the ground floor of a small palazzo called Ca’ Fracca. There are several Saint Adrians. I like to think that this one is Saint Adrian of Caesarea who was fed to the lions in 309 but actually killed with a sword (which appears in the carvings). It could equally be Saint Adrian of Nicomedia who was a soldier—hence the sword—and was martyred four years earlier. We’ll never know. On the other side of the entrance to Ca’ Fracca there is a carving of Saint Jerome, a fourth-century hermit and the person who translated the Bible into Latin. His translation is still used as the official version of the Bible by the Catholic Church. Back in Campo Rialto Novo is a carving of Saint Peter, recognizable by his keys. I hope you’ve enjoyed this journey through the now, not-so-secret symbols of Venice. Have you ever seen a symbol in Venice and wondered what it was? I’d love to hear about it. If you have a picture and know where it was, I can probably help you to find out. This is fascinating Luca and now I want to wander around searching for more! We visitors are usually so busy trying not to get lost that we miss so much! I’d love to see them Jane. If you like send me a message at luca@lucamarchiori.com that would be great! yours yet. I just read it now. How lucky to have been able to have spent time in such illustrious ghostly company. You had me at Rosalba Carriera. I’m glad you enjoyed it. It was fun to write and to wander round taking all the pictures. I have loads of pictures of other symbols from other parts of the city too. Ah yes, the Basilica is fascinating. I should think the symbols in the Basilica would warrant a book as well. 🙂 Dan Brown needs to read your blog. I think they would. Shall I tag him on twitter? Now I feel that I have to plan another visit to Venice! Thanks so much for sharing your photos too. Aren’t they wonderful? Particularly the shoes. I noticed on your post for Calle de la Bissa you found another mulberry tree. When I was there this past June, we noticed many moor/camel symbols in our quartiere. We stayed on the Fondamenta Gaspare Contarini near Madonna dell Orto. It was interesting to notice these symbols, but we didn’t know what they meant. Do you? Ah, you were staying near Campo dei Mori. The statues are supposed to represent three merchant brothers, the Mastelli, who are called ‘moors’ as they came from Morea in Greece rather than being from the Middle East. The figures are known as Rioba, Sandi, and Afani by locals. The house with the camel on it was the Mastelli family home. The camel denotes the origin of the spices that they sold.